Fruit can be grown in pots, containers, balconies, terraces, basically anywhere. It’s not difficult, it’s easy to prune them once you learn how, you can have espaliered and other fruit forms in any small suburban garden, you can have different trees and have a good yield for a family who loves fruit. Fruit can be grown in pots, containers, balconies, terraces, basically anywhere. It’s not difficult, it’s easy to prune them once you learn how, you can have espaliered and other fruit forms in any small suburban garden, you can have different trees and have a good yield for a family who loves fruit. Today, even the smallest of gardens can accommodate a pear and apple tree enough to supply a whole family with a season’s worth of fruit. The trick is to select the right varieties and to engineer the way they grow. We all dream of having a large garden but today’s frenetic and active lifestyles mean that we simply don’t have the time. In reality most people have smaller plots so one has to approach fruit growing slightly differently. Even if your outside area is tiny you can still grow fruit trees in containers. There are dwarf fruit trees on the market which are perfect. 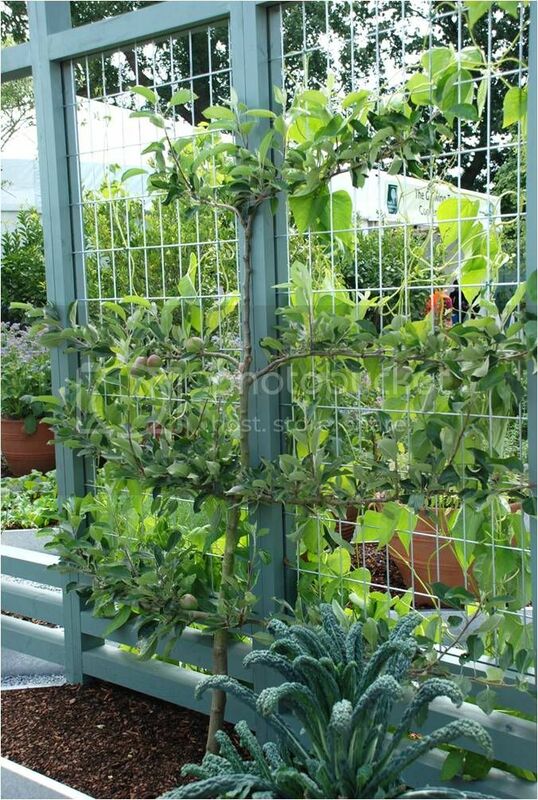 Fruit trees can be trained to be space saving whilst still being highly productive, and there is a huge variety of shapes to chose from: cordons, multiple cordons, step-overs, fans, bush, goblets, espaliers, pyramids….all are possible as long as they are grown on the correct rootstock. This will determine their final size. A few things to remember before you visit your local garden centre or fruit nursery – I prefer nurseries as they are usually growing local varieties and also they really know their stuff! 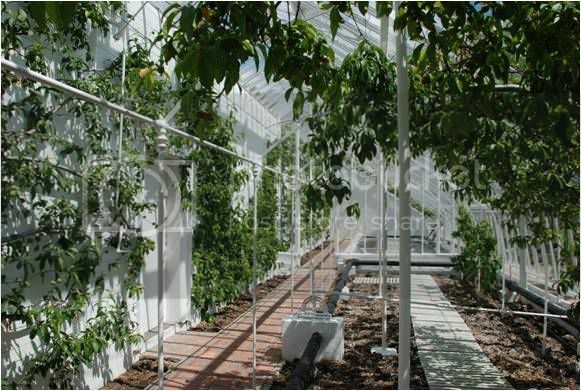 Check the space you have available – containers might be the option for you, or consider planting along a fence where the fruit trees can be trained in their restricted forms along wires and canes. Think about the type of fruit you want to grow – apples, pears, apricots, cherries, etc. Consider the site – you will need a warm, sunny and sheltered site, south to south-west is the best. The soil needs to be well drained soil is best, at least 60cms deep with a pH of neutral or slightly acidic 6.5 is good. Extremely alkaline soil will stress your trees. You can get a test kit from most garden centres and nurseries. For unrestricted forms, meaning larger trees in larger gardens, pruning is done in winter, whilst for restricted forms pruning takes place in the summer. Oddly enough, restricted forms usually crop earlier than normal fruit trees and they are also more productive. This suits a smaller garden well, saving space whilst giving maximum yields. Apples and pears are the easiest fruit trees to grow and perfectly suited to our climate. It is always best to ask a local specialist nursery – see the list below but ask around or search them out. As well as apples and pears, it is also worth considering apricot, cherry and other more exotic fruit trees. These days the RHS has tested many and have awarded the AGM’s (award of garden merit) so check on the RHS website for the best varieties with disease resistance and good yields. You could even try to grow grapes – check the RHS website on the best varieties for England – they have been trialing a few over the last few years and have a good selection to choose from. 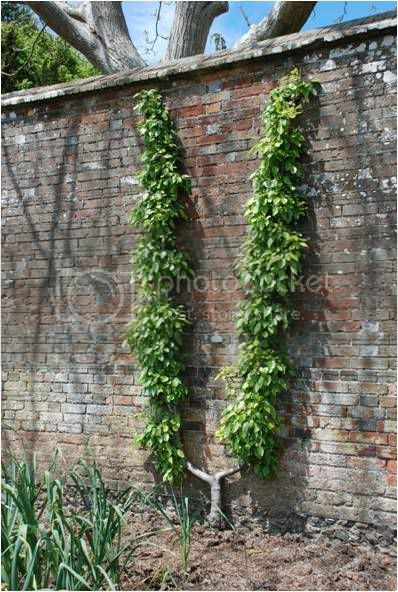 They are also very ornamental as you can see below and if you have a very large garden you can plant the tender ones inside a greenhouse or a Vyne House (West Dean Gardens)! Quince A to be used for espaliered and bush trees. Quince C is suitable for cordons as it is less vigorous than the above, but I have used it for espaliers, cordons and bush trees too. 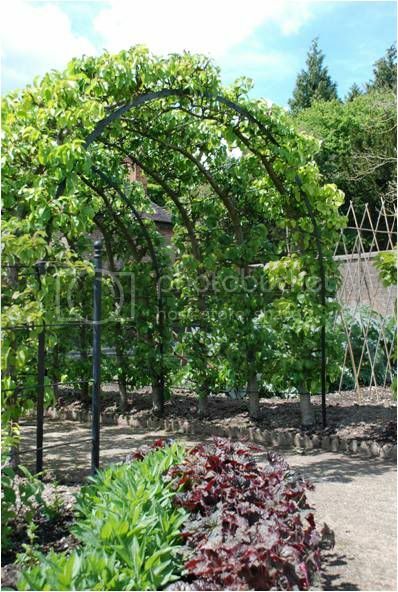 You could create a pear arch like the one below, on a smaller scale, at the start of a path for example. Cherry, Plum, Greengage, Apricot and Nectarines all have different rootstocks. Just ask the specialist nursery which is best for your garden taking into consideration your requirements and the site. Planting space is important. When planting along a fence, for example, keep oblique cordons at least 60cms apart, espaliers at 4 metres, or the equivalent of two fence panels, same with a fan. Oblique cordons are the best form to go for in a very small garden as they save space but they also produce large amounts of fruit. Partially trained trees are available from specialist nurseries with 1-2 tiers of branches for espaliers, fans and pyramids. Apple: James Grieve as an oblique cordon - great tasting, green flushed with red, juicy and fresh to taste. 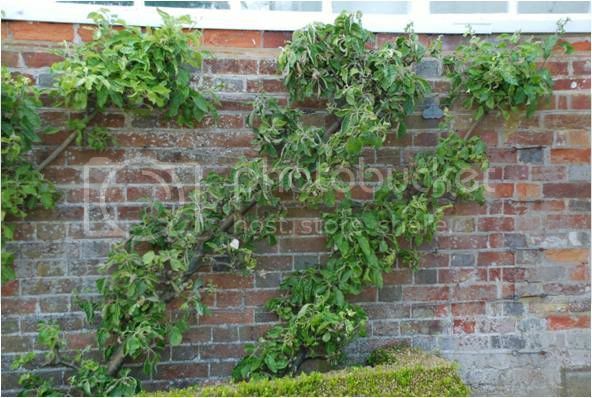 Worcester Pearmain as an espalier - crisp, juicy, sweet taste. Pear : Doyenne du Comice or Williams as espaliered - both buttery fresh and crisp taste. 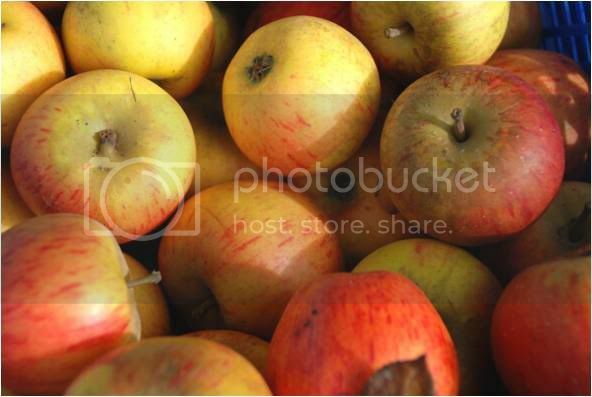 Apple: Discovery or Falstaff are great for containers. Pears: Concorde or Red Comice are easy to grow in pots. 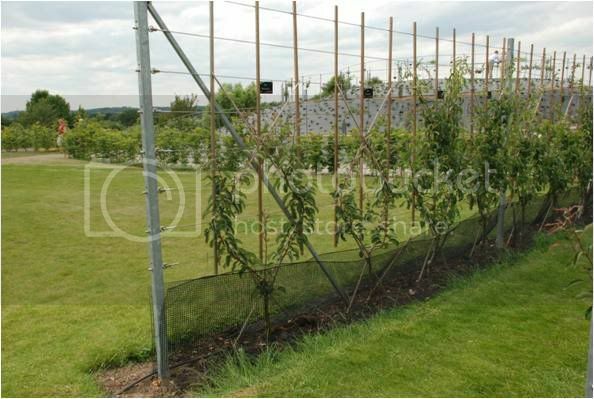 Ken Muir: http://www.kenmuir.co.uk/ - good range of partially trained fruit trees available. from late November until March. Keeper’s Nursery: http://www.keepers-nursery.co.uk/ - a good range of tree forms. Chris Bowers & Sons: http://www.chrisbowers.co.uk/ - ready trained fruit trees. Françoise Murat & Associates specialise in interior, garden & landscape design. 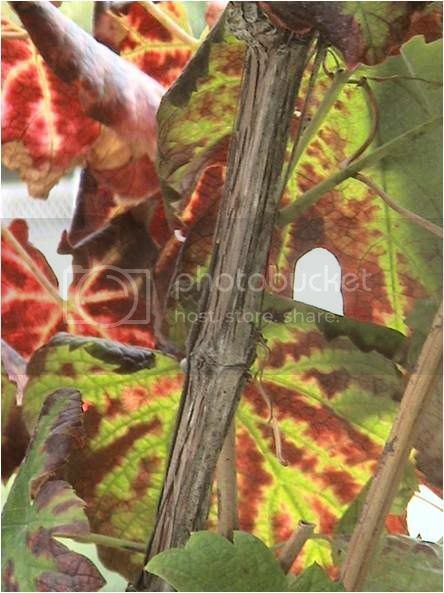 For more garden and interior design information visit us at www.francoisemurat.com.